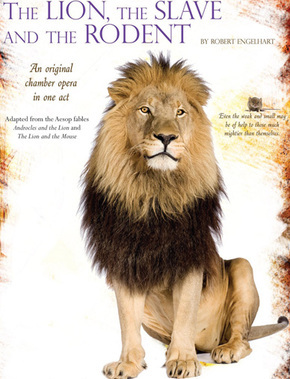 Our new adventure this year will be a new comic chamber opera written and directed by Rob Engelhart, The Lion, the Slave and the Rodent. If you've never been to an opera, don't miss this opportunity. It's in English. It's one act and is based on two Aesop fables. The chamber opera combines two of Aesop's fables - "Androcles and the Lion," the story of an escaped slave who pulls a thorn from the paw of a lion and is later spared by that same lion when they are forced to fight in the arena; and "The Lion and the Mouse," the story of a lion who decides not to eat a mouse that wakes him up from a nap and is later rescued from a hunter's net by that same mouse. Told entirely through song, the opera contains jokes and humor that can be enjoyed by kids and adults. It also has numerous references to popular musicals, including "West Side Story" and "The Wizard of Oz." And remember that "Even the weak and small may be of help to those much mightier than themselves."